San Luis Obispo, CA - The San Luis Obispo County Film Commission (SLO County Film Commission), a department of Visit San Luis Obispo County, the countyâ€™s destination marketing organization, reports a significant increase in the number of production leads over the last year. As of January 2014, over 180 leads have come through the film commission office for projects ranging from independent feature films, to television programs, commercials, catalog shoots, music videos and documentaries. These projects result in an estimated $4.1M economic impact for San Luis Obispo County. The SLO County Film Commission acts as the liaison for production companies and location scouts. Connecting them to specific sites, local services, and lodging in San Luis Obispo County as well as connecting production teams with the proper permitting agencies in each community countywide to ensure appropriate guidelines are followed for filming within county boundaries. For every production that comes to San Luis Obispo County, the impact on the economy is significant. In addition to the costs of film permitting, productions and their crews (ranging from 5 to over 100 persons) use local services, stay in hotels, dine at local restaurants, and purchase fuel locally. From the reported 183 filming days that occurred in 2013, the estimated economic impact reached over $4.1M including over 364 hotel room nights. Over 38 productions can be added to San Luis Obispo Countyâ€™s list of credits in 2013 alone. Notable credits include History Channelâ€™s Top Gear USA, Animal Planetâ€™s Redwood Kings, ABCâ€™s The Taste, Lifetimeâ€™s Preacherâ€™s Daughter, French Vogue, independent feature films The White Orchid and Lighthouse Keeper, and commercials featuring Ford, Mercedes, Porsche, Mazda, Volvo, Maserati, Subaru, Jeep, Land Rover, Microsoft and many more. The SLO County Film Commission will continue to act as the liaison for filming in San Luis Obispo County and anticipates even greater success in 2014. In addition to assisting production companies from the ground floor, the SLO County Film Commission plans to continue its partnerships with the San Luis Obispo International Film Festival, Film Liaisons in California Statewide (FLICS), and the California State Film Commission to bring further awareness to San Luis Obispo County as a choice filming destination. 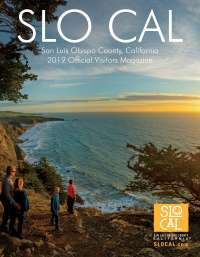 About Visit San Luis Obispo County: Visit San Luis Obispo County promotes San Luis Obispo County through advertising, marketing, public relations and group sales. Its member base is comprised of over 500 tourism industry-related businesses including lodging properties, restaurants, wineries, golf courses and retail stores. We invite you to visit the website at: www.visitsanluisobispocounty.com. For more information or to submit your property as a filming location, please contact our office at 805.541.8000 or info@visitsanluisobispocounty.com.